eVisa Application Or Vietnam Visa Application Online | How does it work? Home » Vietnam Visa on arrival posts » How it works? In order to get your visa at the airport of Vietnam (Visa on arrival), you will need to apply online for the Visa approval letter. This letter is approved and published by Vietnam Immigration Department. To apply for Vietnam visa on arrival online, you need to fill in our “Vietnam visa application Form online“, pay the service fee to get your “Visa approval letter” within 1 or 2 working days and then pick up your visa at your destination airport (Noi Bai airport (Ha Noi city), Tan Son Nhat airport (Ho Chi Minh City city), Cam Ranh airport (Nha Trang city) and Da Nang airport (Da Nang city). When the visa approval letter is done, we will forward a copy to your email. Copies of the same document will be forwarded to Vietnam Immigration checkpoints at International Airports in Vietnam on your behalf. When you arrive in Vietnam, the Immigration officers will have those documents ready on their computer system and will be able to issue your entry visa onto your passport. 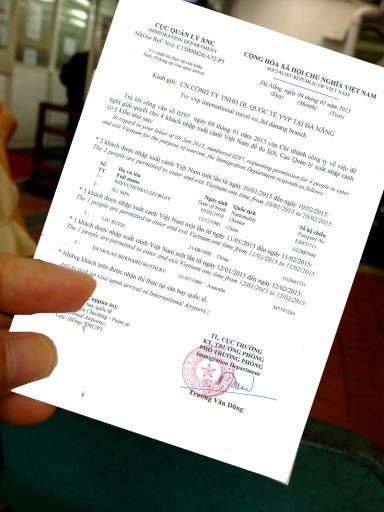 – Wait for 1 – 2 days for approval from Vietnam Immigration. Rush service is available but extra fee will be charged. – On receiving the visa approval letter by email. Check it careful to make sure all information is correct then print a copy that you will show for boarding and getting visa on arrival. • Because of the Vietnam Immigration Office policy, they list a number of people on the same visa letter, we offer private/confidential visa letter showing your name or your group in 1 letter without others name on your letter. But you have to pay an extra 8USD/letter for you or your group. On Arrival Support ($20/pp) : Our staff will meet you in front of the landing visa counter or at the visa on arrival desk to help you get fast visa and get rid of the queue. Excluded visa stamp fee. VIP Airport Fast-track ($35/pp) : Our staff will meet & greet you in front of the landing visa counter with welcome board, our staffs will take all the procedure to get your visa fast & checking in immigration fast to baggage area. Excluded visa stamp fee.